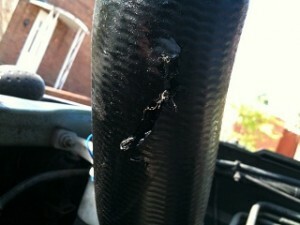 The last few days the Freelander has been driving like a dog and belching black smoke under hard acceleration or load. I’ve had a Rover Ron Synergy 2 installed for nearly 2 years and I thought with the recent heat it had maybe gone west. I emailed Rover Ron and as always he was very helpful and suggested looking at the turbo hose. Before I’d read the email I had a look under the bonnet and there was a lot of oil on and around the manifold. The culprit was indeed a split hose and the oil was diesel! Ron was right! Anyhow I’m glad it’s not the Synergy 2 box because I’ve been really chuffed with that and would recommend them to anyone who owns a Td4 Freelander or Rover 75/ZT with the BMW M47 engine. Turns out the replacement part is PNH000020 and they’re around £20 for a genuine part or £15ish for a Britpart or Allmakes. I did consider silicone hoses but they’re about £90 a set. Maybe I’ll not go with the silicone just yet. Off to Dartmouth for a few days tomorrow so I’ve done a temporary bodge with a beer can and some gaffa tape. Found an independent specialist FRL Auto Services in Dartmouth so may give them a call while I’m there and see how much it costs. Will report back with results..